That’s my question also. Revan Mark, GK mass attack etc... seems like they would drop him very quickly since he’s not “dying” between each attack. That was the same point I was making - the interaction for multi attacks is pretty cut and dried, but it’s those who deal multiple instances of damage with a single attack that I am wondering about (again using Scav Rey Flurry of Blows, it either misses due to dodge/foresight/whatever, or it hits dealing damage twice, plus once more if buffed, 55% chance for an additional damage.). 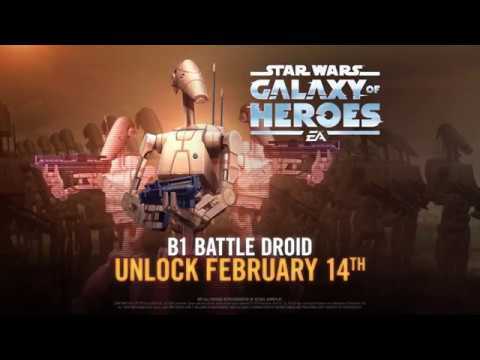 Does each ‘damage’ within that one attack remove 8 stacks of Droid Battalion, or does the single attack only remove 8? As written, it should remove 8 each time, and following along with your fearsome foe description above, I am reasonably sure that Sabine’s Blasters Akimbo basic (which deals damage 2-5 times) does indeed allow multiple sets of 5% TM increases to Sion in phase 2 of the Sith Triumvirate Raid. Follow up to the same thought; will hitting an Exposed or Death Marked (Although I don’t see how Death Mark would stick currently, since you deal damage to apply it, the kit would immediately cleanse it), remove 8 or 16 stacks? When does the cleanse on damage come into play (thinking RJT lead here)? Does hitting the Exposed B1 cleanse the Expose, then deal damage for 8 stacks, or vice-versa for 16? Does that cleanse on damage take place before or after the check for a critical hit and 70% chance to apply expose? Attack of the poodle droid! I don't think that multi or mass-attacks would work on B1? Since, in my experience, multi/mass-attacks either take the enemy to 0 health, then they die (which would make B1 lose 8 stacks, since it only "dies" once), or the multi/mass-attack is outright cancelled (meaning that B1 would only be "killed" once, thereby losing 8 stacks). How will the AI react to a Special with cooldown 0? My understanding was that the AI always prioritizes Specials, so will it never call the basic under AI control? Going to make these droids very tricky to deal with if that is the case, since AOE is feeding right into B2’s hands for 100% TM gain. Without seeing ig-100 or droideka kits yet, I already am foreseeing that getting daze on B2 and cleansing a (presumed) pre-taunt to focus fire down B1 is going to be one of the better ways to deal with these guys. Calling a hard counter prediction - RJT lead with threepio or Holdo will shut the droids down hard. How does it interact with Traya isolate or Thrawn fracture? Good Question: Will this be a marquee? To clarify - does Fracture remove 32 stacks? Likewise with Scav Rey's 2nd special? The amount of stacks probably increase with gearing so there will probably be a minimum gear level needed to get the 100 stacks to start the battle. I guess you would mod B1 with Speed and Potency sets? Get as much Speed and offense as possible with the potency to land the target lock. No sense in doing defense, health, protection, crit chance or crit damage. Maybe tenacity? Interesting kit but should be taken down fast by some teams like Han/Chewie combo(Hans special follow by basic with 2 assists from chewie can be 5 shots so 40 stacks gone) Revan Jedi with Gen K. Revan special for 5+ hits followed by Gen K special for 5+ hits gets it down 80 stacks+. Gear for speed and offense. He better not require gear thar gives health(Carbanti, Stun guns) if he has 1 HP that is such **** for eating up gear. @CG_SBCrumb what about with mass assist or multi-hit attacks? Will B1 lose 8 stacks for every hit in one attack chain or will B1 just lose a total of 8 stacks? Hmm...Could this be the best 3 star character ever? Health and defense stats won’t matter. Only thing is damage and the 12 speed from G12 gear. Wonder how much damage he will do. I feel like a lot of questions will be answered when we see the GG rework and Droidekka - Magna Guard... I could see a tanky - taunting Magna guard or dekka protecting the whole group while GG, B1, and B2 have at it. If it’s going to be arena viable I feel like there has to be sort of anti counter mechanism. B2 and B1 both with AOE abilities that Rebels and other counter teams would just eat alive. B1 isn’t going to come back very long if he’s getting smacked with constant counter attacks. And B2 will give a CLS lead more TM than he gives droids. Have you ever seen a Traya team vs the new CLS teams? Remember what happens when Sion uses that AOE, even with all of the defensive mechanisms from Traya? I’m not criticizing the characters yet, because we don’t have 3/5 of the team. I was just trying to predict what we might see coming based on the current weaknesses. If thermal detonators aren’t a hard counter to it I’m going to be disappointed. Loses 8 stacks of Battalian but with his special on 0 cooldown he’ll just gain 8 stacks on the start of his turn. This looks amazing. Much more potential in this kit than the palpmobile.